Don’t get me wrong, the Arsenale is one of my favourite places in the world. It is a wonderful space for exhibitions, its spaces, structure and material are a source of constant inspiration. But it can be overwhelming mostly because of its size, and come Biennale time because of the overflow of information. When you do reach the end (some won’t make it that far) there is a bit of relief, after a refreshing walk along the water it leads you to a beautiful garden right at the end. That does seem like the perfect conclusion of this journey that is the Arsenale part of the Biennale. 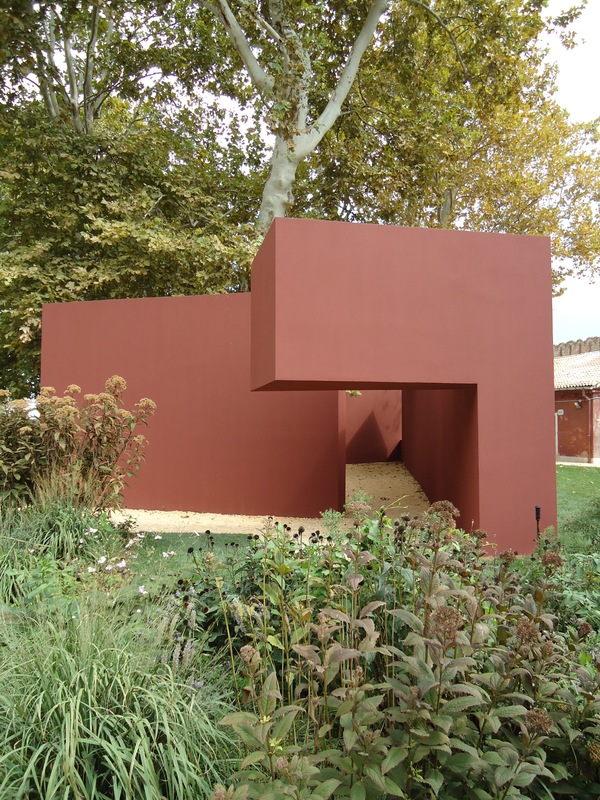 This is the same thing that I thought about the pavilion of Alvaro Siza. After exploring, reading, watching, listening to all the interventions and projects on the way this one was about Being (i.e the perfect conclusion). At first, we were sort of looking for something more. But after a while, walking through it, just being there, relaxing for a while, you realise that Everything is already in it. It is one of the strongest interventions this year. This pavilion is about strengthening the place where it is set, drawing ones attention to the inherent qualities of the place where we found ourselves. 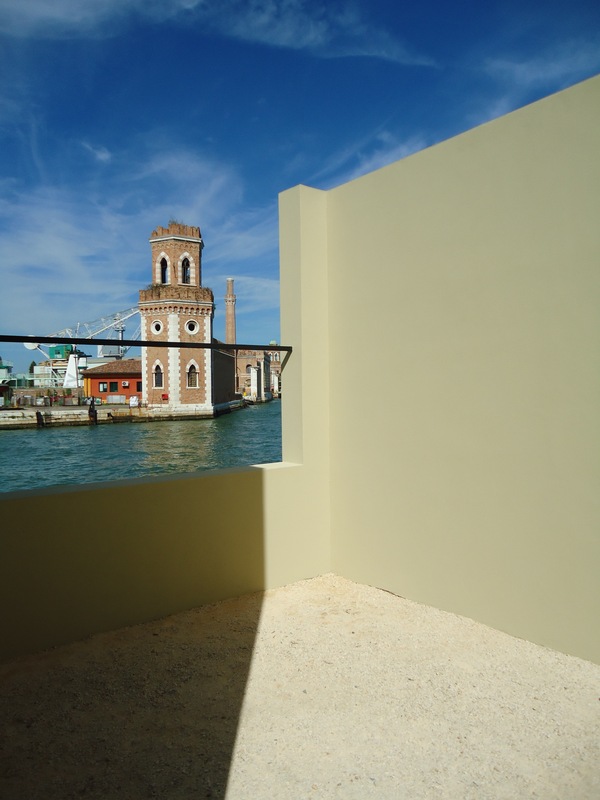 The colour for one, complements the adjacent warehouses now peeling stucco (used as exhibition spaces, now housing Gigon/Guyer Architects), and is incredibly Venetian. It also creates a perfect harmony with the lush greenery surrounding it. It has a clear entrance signalled by a cantilevered volume which is the only place where you have something overhead, the rest of the pavilion is within an enclosure made of just three walls. It has an easy flow, but while you’re inside, you continue to make discoveries, framed views to the exterior, plays of light and shadow and openings inviting you and leading you through it. 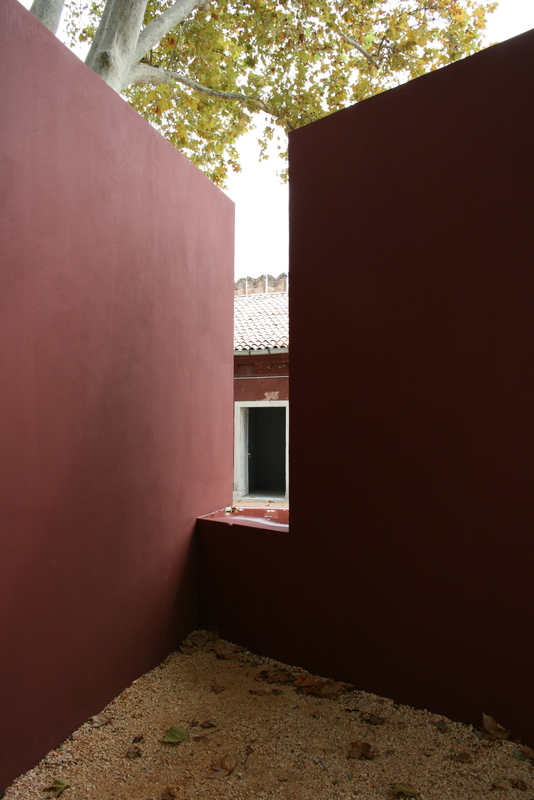 Siza’s pavilion was a real treat. A well earned reprieve after the mixed bag of the Arsenale. As Sigrun mentioned it is definitely Venetian. The meandering route, with its many unexpected views and ever-present sky reminded me of my first dizzying trip through the city’s narrow and completely inscrutable network of streets. 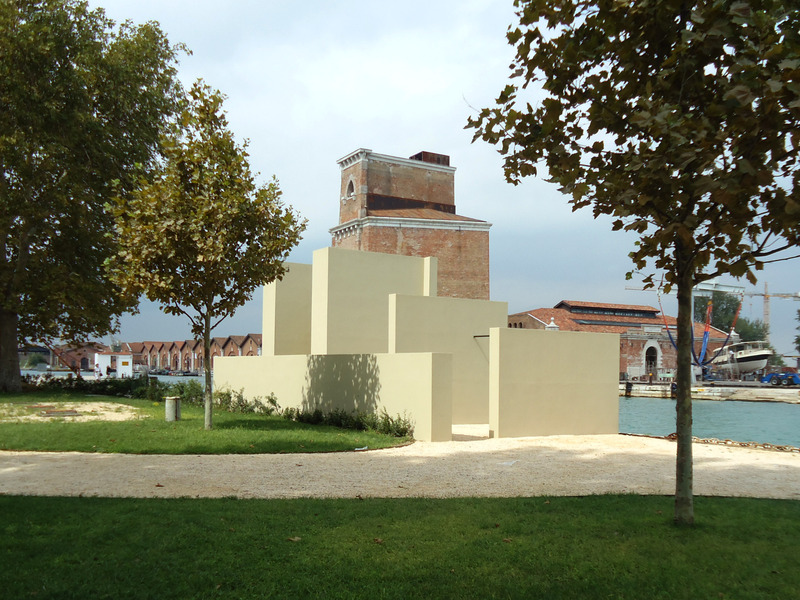 The pavilion’s sister (or perhaps brother) structure by Siza’s longstanding collaborator Eduardo Souto de Moura is equally engaged with its context. 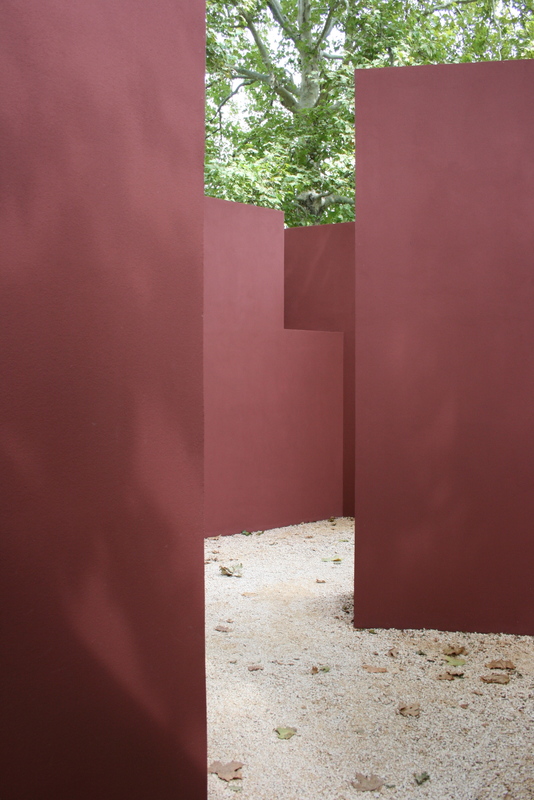 It precedes Siza’s pavilion, forming a new gateway to the gardens and framing views out across the water – a low wall guides visitors to the garden beyond. Sandy, with a mossy green hue it contrast effortlessly with the surrounding brick and red painted stucco. The structure’s staggered form echoes the composition of the sheds, towers and chimneys across the water. 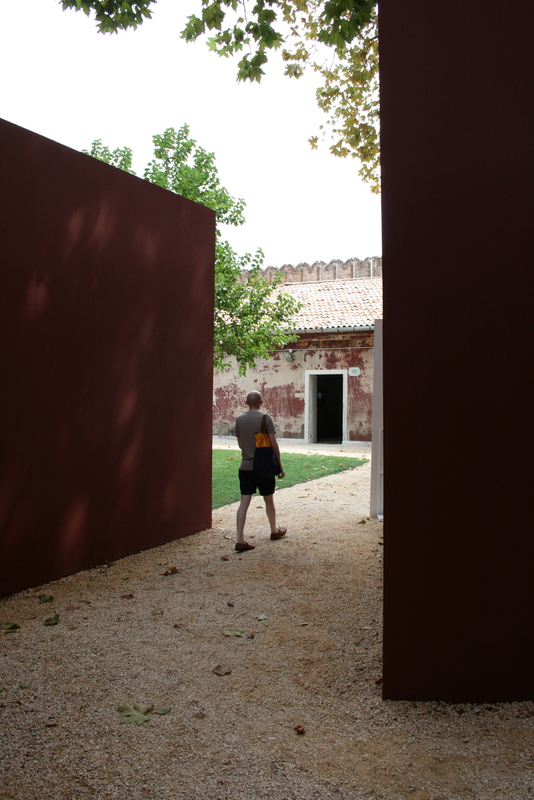 When I was walking through Siza’s pavilion I remembered visiting Peter Zumthor’s Serpentine pavilion last year. They are remarkably different in their aspect but share the common goal of framing and enhancing a garden. Zumthor’s pavilion was very dramatic – a dark form clothed in a hessian-like fabric and painted in a bituminous black paint. The pavilion was entered through squat dark openings, leading to a dimly-lit corridor. This high and narrow corridor wrapped around the perimeter of the pavilion, and lead to a dazzling central garden (see below). 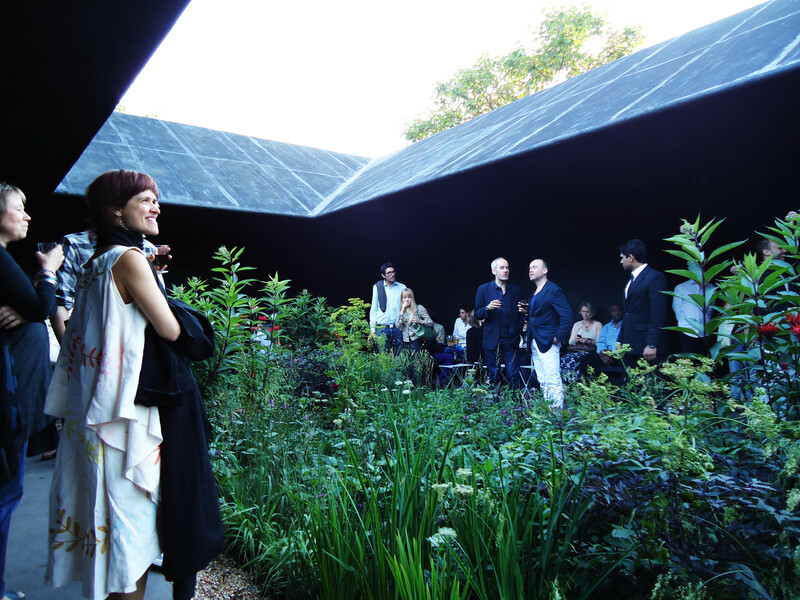 Here context is avoided, this pavilion was not a Londoner but offered a totally divorced space with an oddly dampened acoustic and lush oasis of planting – a place for contemplation. I thoroughly enjoyed the pavilion, but couldn’t help but wonder why Zumthor had chosen to ignore the beautiful setting of Hyde Park – it could have been realised anywhere in the city, or indeed the world. I have little to say about this year’s Serpentine pavilion… Here’s hoping London has some Portuguese visitors in the future!